I’m writing this from our hotel in Quan Ba (aka Tam Son) with a cup of hot Nescafé that Margaret stole from a guesthouse in Laos. Mmmm. The sun did not come out today and we gained some serious altitude so it’s pretty chilly right now. My bike shorts are drying outside on an electric wire and I’m enjoying being stationary inside on my comfy and clean bed. 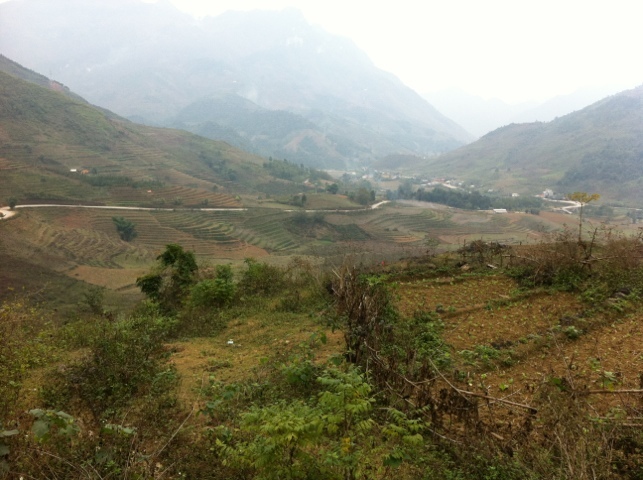 Today’s ride from Ha Giang to Quan Ba featured our first real climbs (steep section of 9.5 km uphill- eek!) 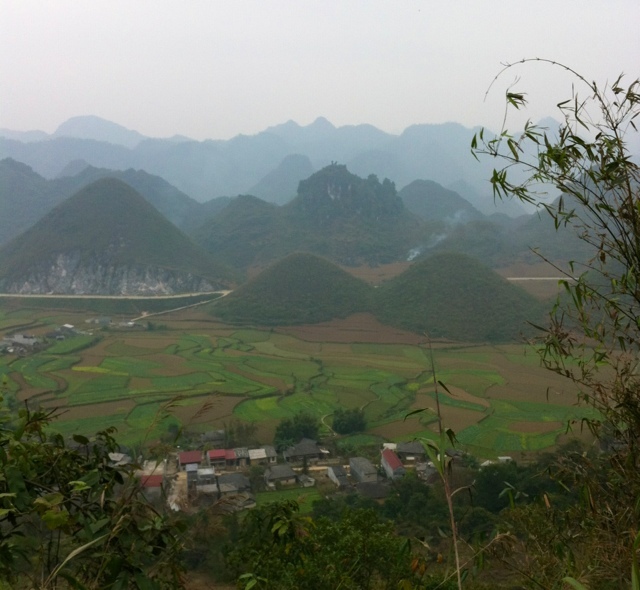 as we zig zagged our way up to Quan Ba Pass aka “Heaven’s Gate”. It wasn’t very heavenly, but maybe it was just the thick fog that made it hard to appreciate the view. 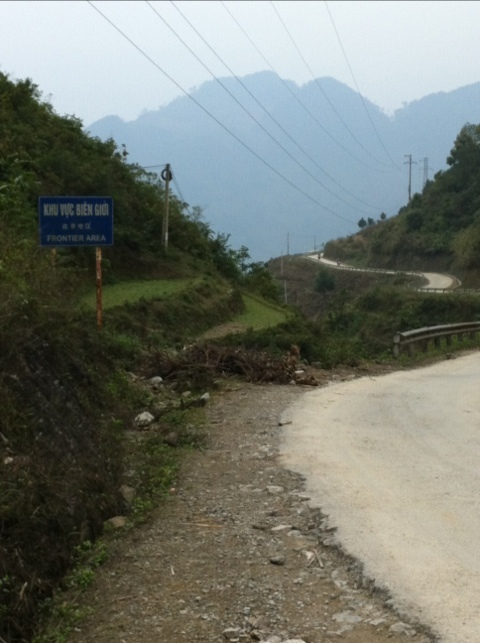 A bit after the pass, we came to the aptly named “fairy bosom” hills, which had us in a fit of giggles. Or maybe we were just deliriously happy to be 3 km downhill from town! 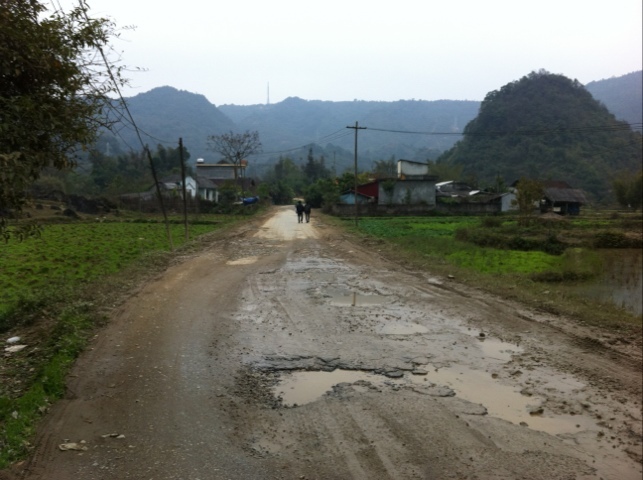 The road was narrow but motorcyclists gave us plenty of room and we only had to pull off the road for busses zooming up or down the mountain a few times. Thank God for low gears, we used them a lot today! After 48+ km today, our legs are still feeling ok, which is good because our hardest days are still to come. This has been the hardest cycling that both Margaret and I have ever done. We’re both happy to be doing something that used to intimidate us and I’m sure that after the positive experience that we’ve had so far, we’ll both do more biking trips in the future. My biggest challenge is my mental strength to keep on going and not stop after every switchback to catch my breath! I know that my body can do it, I just need self discipline to just.keep.pedaling! 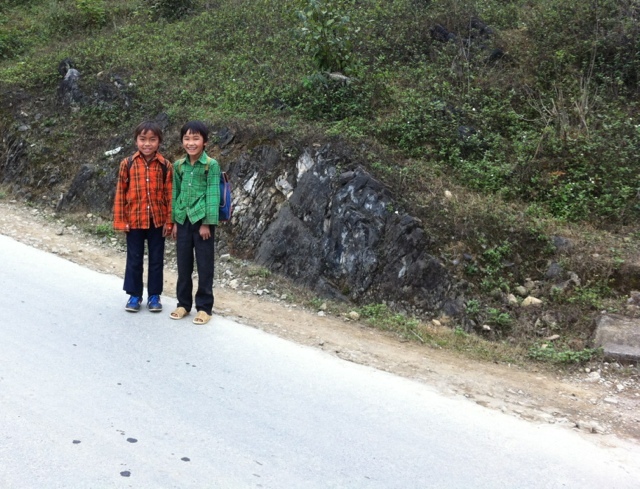 At the beginning of our first steep section, four little boys ran with me, trying to race me on their walk to school. It was fun to have them laughing alongside me and the competition didn’t hurt either! We are now thoroughly acquainted with Vietnamese fried rice. It’s the hardiest, most readily available meal that we’ve been able to find. Now we know why Vietnamese people are all so skinny in this land of rice noodles! Today our special treat was a Gu energy snack (Thanks Mom!) that tasted like brownie batter. Maybe this evening we’ll wander around town in search of some other sweet snack for more calories. ChocoPies seem to be all the rage here. Sorry the pictures are out of order… Im stealing wifi right now and not sure how long it will last. I am enjoying your pictures very much. So glad you can share them with us and also your journey. Sounds like you are having a great time. Have fun. « Day 5 recap: We put on sunglasses!